A lot of indoor gardeners are growing indoor plants but all of them are not successful. Right? But why? A great portion of them doesn’t know the importance of having indoor grow lights. But you are not similar to them. Rather you are several steps ahead. Congratulation! You can realize the necessity of having the best LED grow light or you already got its benefit that is why you are here. But which sizes or which kinds of lights will be best for you? You will see so many grow lights in the market though all are not best in quality. Agree? Almost all the plants are grown outdoor consuming daylight. And you should know sunlight is a very bright light. So, you definitely need a light source which is able to emit bright light. 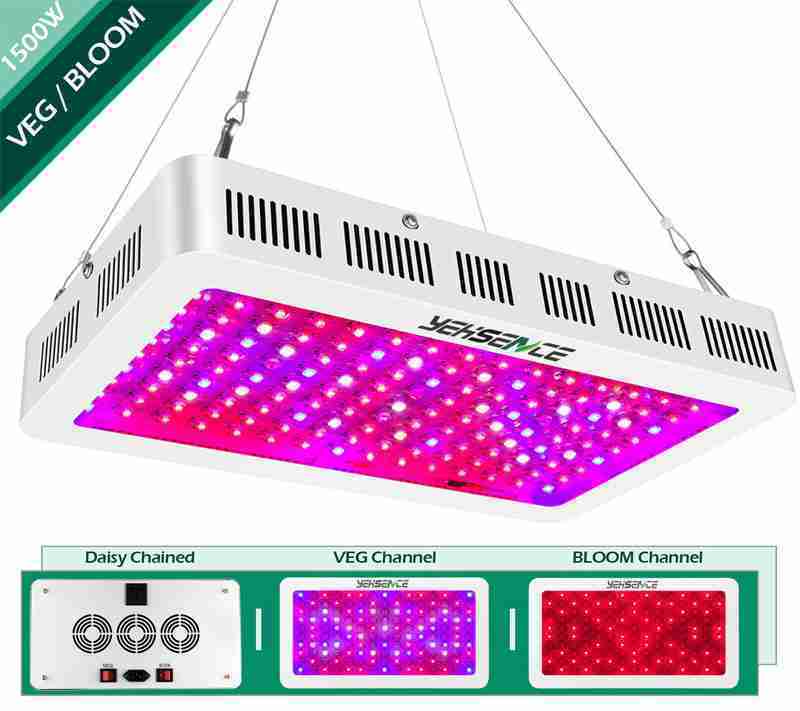 Here we recommend Yehsence 1500w LED grow light for you. Let’s see the features offered by the lights and benefits we can get. What You Will Get From The Package? How many lumens are exerted from Led grow lights? Can I control the LED light with time setting? Can you tell me the light requirement of plants at different stages? Do LED grow lights damage your eyes? How much areas the light can cover? Yehsence is a very reputed brand as LED grow light manufacturer. They are always promising to produce a good product. And our 3 weeks research also says that the product is up to the mark with the quality. It has some features which are very useful for your indoor plants. 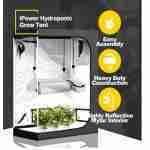 The LED grow light contains two switches Veg switch and bloom switch. 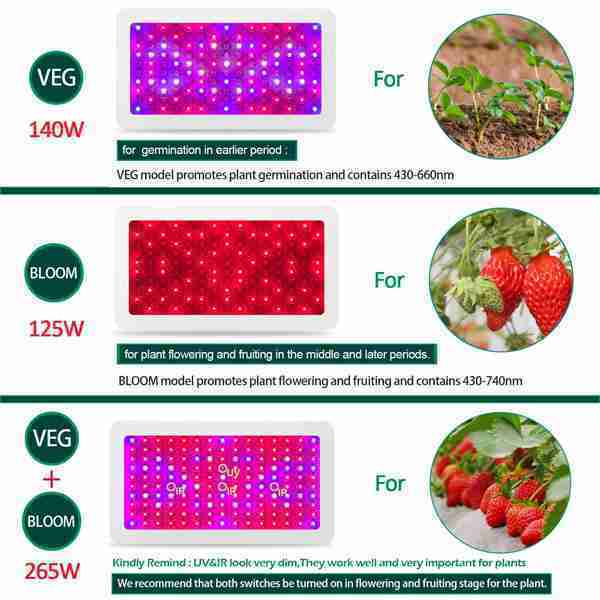 The manufacturer knows that the plants will grow more if different lights can be applied at the time of different stages. That is why they include two light switches. You should use the Veg switch at the time of germination period. Use the switch from sprout stage to the leaf stage. 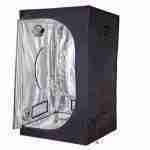 On the other hand, the bloom switch ensures the optimum temperature and provides lights to flowering and fruiting. To get the best result we recommend turning on both switches. It is an important feature to look before buying a grow light. Yes, how many areas are covered by the light it is an important factor. The light usually covers 5.4 X 5.4 feet but with the light, you can cover a maximum of 6.5 X 65 feet. As an indoor grow light it has perfect coverage are. Every 15w valve contains 3 LED chips (5w each) that is brighter than the single or double chips. We told before, plants need brighter light to grow up. You plants start growing up quickly and efficiently after getting bright lights from it. The light is compared to the sunlight and the plants enjoy the light the same as natural light. You may have a large indoor garden. But a single LED light is not enough for your indoor gardening project. What can you do then? The manufacturer keeps this thing in mind and they made the light maintaining daisy chain design. Because of that, you can connect more lights parallel. They also provide a daisy-chained cord to connect. But, do not connect more than 3 devices. The LED sources never heat up extremely up and they don’t exert any light or wave which is bad for your plants. Every LED source has thermal silicon to keep it cool. Three cooling fans are always cooling your light source and 2mm holes are created for heat convection. In the end, it is 100% safe for your indoor grow plants. Think, you have two options in hand but you have to choose one. Two products and you get the same output form them but one consumes more energy and the other consumes less. Which one will you choose? Definitely, you choose low energy consumption. So, how we keep this LED light left where it consumes 80% less electricity than other light? 24” – 48” adjustable hanger. Dual switches option for different stages. Up to 3 lights can be connected parallel with the daisy-chained design. 3 chips provide much bright light as natural sunlight. 100% safe for indoor plants. The excellent cooling system keeps the light source cool. 2mm holes ensure heat convection. 3 Years warranty and friendly customer support. All essential accessories come with the pack. The fans need to clean at regular interval. LED light emits more than 300 lumens per watt where the typical traditional lights are able to produce around 100 lumens per watt. Vegetative period requires 12-14 hours. Flowering period requires 9-12 hours. Fruiting period requires 1-8 hours. Some people believe and they say LED lights are not good for our eyes without any strong basis. This concept is totally false. LED lights never damage your eyes if you use them normally. They can cause damage if you directly stare at LED bulbs for hours to hours. It covers 5.4 X 5.4 feet but you can adjust the coverage area which can be maximized to 6.5 X 6.5 feet. There are few LED lights you will get which has the features as this light. If you check the comment of users of this light, you can understand how much effective it is! This Yehsence LED light doesn’t have any significant negative points that may discourage to use the light. 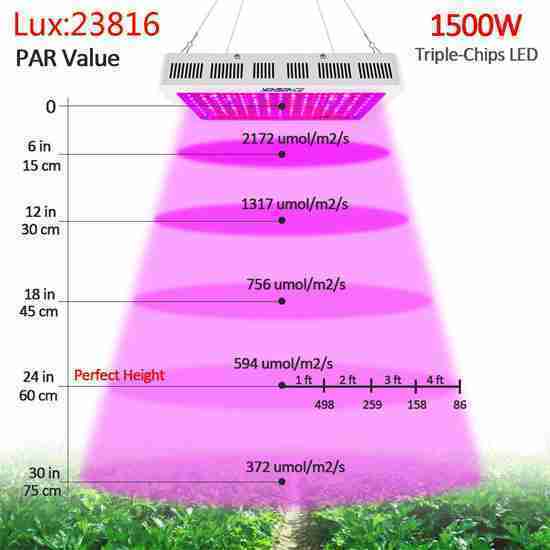 Really, if you want to buy the best LED grow light at a tight budget, you will not find better option except this one. But the output of this Yehsence 1500w LED grow light is comparable with the higher expensive items. Thanks, Yehsence for producing this light. VIPARSPECTRA 450W LED Grow Light Review- Is Worth Your Money?